The Big Bike Revival is here! We all remember those carefree childhood days with the breeze in our hair and the freedom to go wherever we wanted, whenever we wanted on our bike. Few things in life are better than a cycle ride, whether it’s a trip to visit friends, a daily commute or a pedal to the countryside. Whether you’re still a regular cyclist or you haven’t been on a bike for years, there are lots of ways for you to get out and about on two wheels. â€‹The programme is supported by the Department for Transport and by Transport Scotland delivered in partnership with Bike Re-cycle centres. Visit our Big Bike Revival website to find events near you or email the Big Bike Revival team in England on bigbikerevival@cyclinguk.org. 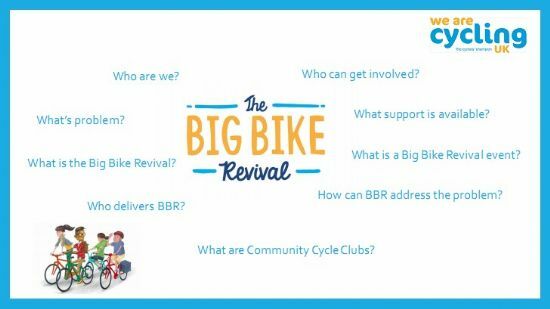 Contact the Big Bike Revival in Scotland on bigbikerevivalscotland@cyclinguk.org. Contact your local Cycling UK cycling development officer to find out how Cycling UK can help you!